Flannel tunic dresses seemed to be everywhere this fall, and well I guess with the lack of snow and high temps mother nature has forgotten to wake up old man winter. Don't get me wrong I am not complaining. 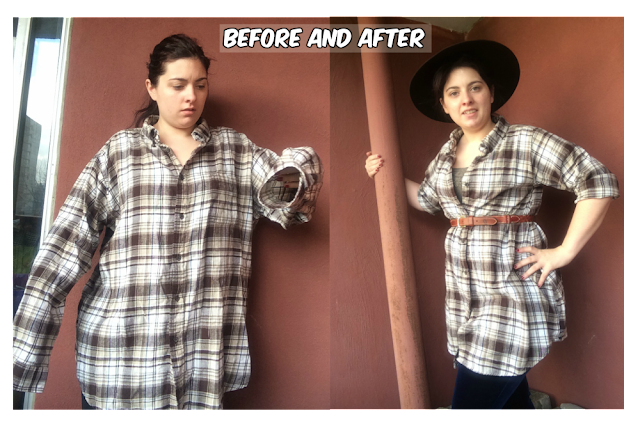 For this refashion I found a XXL men's flannel for $1. To be honest I am notorious for buying menswear to refashion then deciding I think it the way it is, and I might have kept this as it was besides the sleeves were a mile too long for me. Even when they were rolled there was so much fabric it was hard to wear comfortably under a jacket. I was somewhat weary because I have never reattached sleeves before. Most of the time I am making them bigger, smaller, or taking them off all together. I started by removing the sleeves then clipping the fabric where I would need to sew up the arm hole. I also shortened the shoulders for a better fit. The most difficult part was figuring out how to reattach the sleeves correctly. I thought I was going to need to take some of the width off of the sleeves as well, but because I shortened them a good six inches their width was no longer an issue. I am pretty happy with how it turned out! Perhaps I could have made the sleeves a tad longer, but that's me being overly picky they are the perfect length to my outstretched arm (and surprisingly even). I have the same problem! Looking in the men's department for something to refashion. For some reason, men have a better selection of clothes at better prices. I love the awesome buy for just $1, and the shirt looks much better with the minor fixes. Great job. Wow, I am very impressed! I haven't had the courage to shorten and reattach sleeves yet! Great job!